24" inch length of flowing, beautiful chainette fringe. Available in 36 stunning colors! 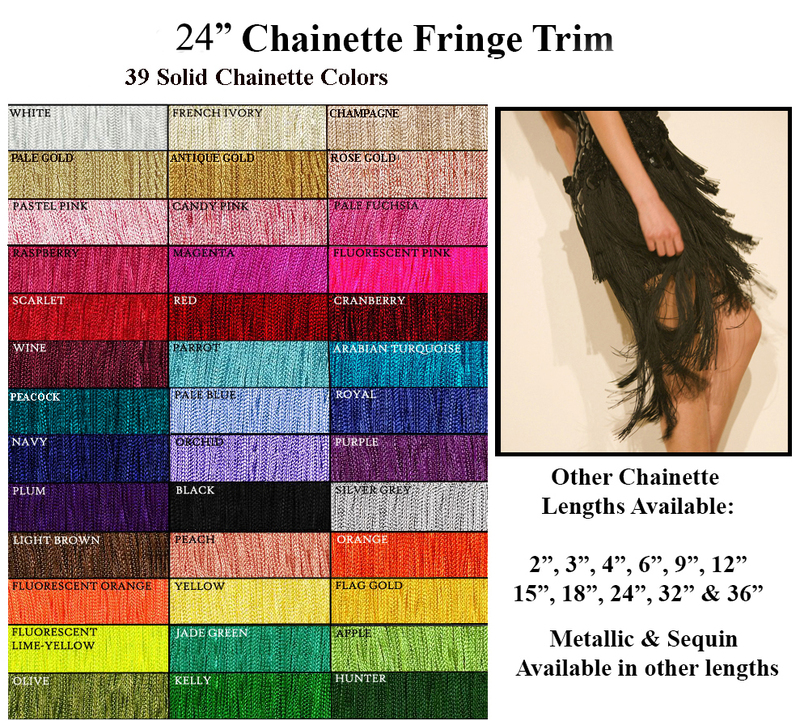 The 24 inch long solid color chainette fringe is $39.75 per yard and comes in 33 colors. The 3 Fluorescent colors are $49.75 a yard. and colors in metallic and sequin chainette fringe as well. Order Samples. This fabulous and slinky chainette fringe is perfect for dance outfits, performance costumes, cheerleader uniforms, evening gowns, dresses, home decor, wedding and event decoration. This is certainly one of the highest quality chainette trims that you can purchase. It is full, with a luminescent silky finish, a very soft flow, plus it hangs and drapes just beautifully. This fringe won't unravel or snag, even if trimmed. Flag Gold Fringe is a vibrant golden yellow chainette. The color of fringe on the uniforms of marching bands and banners. Magenta Chainette, a deep vibrant shade of rose red with a touch of a cool purple undertone. Orchid, a soft orchid with a touch of silver undertones. A very elegant color!